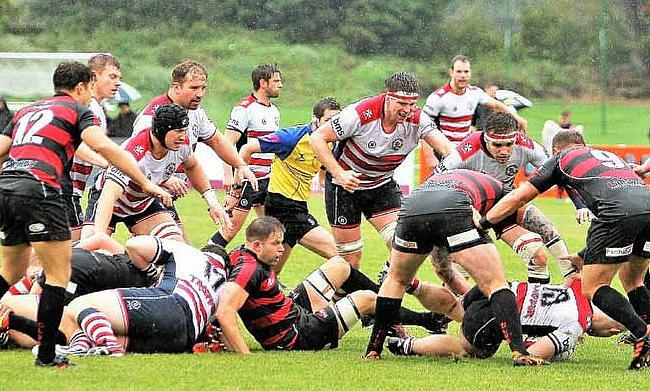 Third-placed Blackheath were beaten by league leaders Ampthill and District last Saturday, but they sit just one point off the summit while Park – who currently occupy fourth spot – are four points behind pole position. Table toppers Ampthill will have a close eye on proceedings in the capital as they look to remain in charge when they travel to Cambridge, while second-placed Old Elthamians host Sale FC. Two sides on the cusp of the promotion race are Chinnor and Rotherham Titans, with both teams aiming for an immediate response to defeats in Round 19 when they face Bishop’s Stortford and Loughborough Students, respectively. Elsewhere in a tight bottom half of the division, Cinderford entertain Esher, Darlington Mowden Park take on Birmingham Moseley while Plymouth Albion go to Caldy. Ampthill and District Director of Rugby Mark Lavery stayed grounded after his side’s excellent win over promotion rivals Blackheath in Round 19. He told the club website: “A very good away performance but still with a number of areas to work on”, however, their 31-26 victory saw Ampthill move to the top of National One. In a way, Lavery was right not to get too carried away as the A’s sit just one point clear at the summit in a title race which is ever-changing. Added to this, Ampthill’s next fixture is against Cambridge and they have become something of a bogey team for the Bedfordshire club. The Blood and Sand have beaten the A’s in their last three meetings with Richie Williams’ side winning 13-6 at Dillingham Park at the beginning of October. Back to the present day and Cambridge occupy 12th place in the table and they are only four points above the relegation places. However, their last two victories have come at home and with their good recent record against Saturday’s opponents, Cambridge may fancy their chances of continuing Ampthill’s hoodoo. It was far from a polished performance against Birmingham Moseley, but Old Elthamians got the job done in Round 19 to maintain their pace in the National One promotion battle. Gavin Lach’s side sit just one point behind new league leaders Ampthill and District and after a mini wobble either side of Christmas, OEs seem to be back in the groove. This weekend, they welcome Sale FC to College Meadow and the hosts will be keen to defeat a recent foe. OEs beat Sale to gain promotion to the third tier in the 2017 National Two play-off, but the North-West club exacted their revenge when the sides met earlier this season as they triumphed 42-38 in a classic at the CorpAcq Stadium. Sale will be hoping for a repeat result and spirits will be high after a superb win over Rotherham Titans last weekend. The club also announced the signing of Spanish international Emiliano Calle Rivas on Tuesday so a victory against a strong OEs side would complete a very positive seven days for Sale. Now it’s time for the latest fixture in this fascinating title race. Since the end of December, there have been numerous key matches between sides fighting for promotion and the final weekend in January is no exception. Third placed Blackheath travel to Rosslyn Park (4th) with both teams looking to recover from recent losses. ‘Club’ were beaten by rivals Ampthill and District in Round 19, but James Shanahan’s side are only two points off the summit despite their home defeat last weekend. Blackheath have actually performed better away from Well Hall over the last month, but Rosslyn Park will be out to stop their fellow promotion candidates on Saturday. After six wins on the spin, Kieran Power’s side have lost their last two matches against Old Elthamians and Darlington Mowden Park so the men from the Rock will be itching for a reaction. Park are only four points behind league leaders Ampthill so a victory in Round 20 would reignite their title challenge. Despite a very frustrating defeat against Cinderford last weekend, Chinnor were able to move up to fifth place in the National One standings. Matt Williams’ side saw a 22-5 lead slip away from them at Kingsey Road in Round 19 so the Black and Whites will be determined to produce a response when they travel to Bishop’s Stortford on Saturday. Leaders Ampthill are still in Chinnor’s sight as they sit eight points off the top, but they will have to be wary of a rejuvenated Stortford side this weekend. Andy Long’s men have breathed new life into a season which seemed to be fading away thanks to back to back victories over Sale FC and Loughborough Students, respectively. The Hertfordshire outfit are now only four points adrift of safety so a third victory in a row for the first time since November 2017 could see Stortford move out of the relegation places as January draws to a conclusion. It seems to be two steps forwards and one step back for Rotherham Titans. After five straight victories, Joe Barker’s men were right in the thick of the title race, but two defeats from their last three fixtures has put a couple of dents in their promotion plans. Their loss to Sale FC last weekend has left the Titans nine points behind leaders Ampthill, but as we have seen this term, Rotherham can respond to a setback and they will be hoping to do the same once again. The Yorkshire outfit may see their upcoming fixture with Loughborough Students as the perfect opportunity to return to winning ways with the Midlands side currently propping up the division. The Students are nine points from safety and last week’s defeat against rivals Bishop’s Stortford would have stung. However, it is far from doom and gloom just yet for Loughborough and they will be keen to get their survival bid back on track with a positive result at Clifton Lane this weekend. What a fabulous response it has been by Cinderford. Not only did they produce an excellent comeback to defeat Chinnor in Round 19, but the last month or so has been very positive for Paul Morris’ side. The Foresters had been on a winless run of five matches, but three victories from their last four games has lifted them up to seventh place in the table and things are looking rosy at Dockham Road. But, Cinderford will be fully aware of how tight the division is below them. Just eight points separate themselves with the relegation places and currently hovering above the drop zone are Saturday’s opponents Esher. Ricky Nebbett’s side are two points clear of the trapdoor after back to back home wins against Ampthill and Caldy so they will now be aiming to translate those results into their away matches. The Surrey-based side haven’t won on the road since the beginning of December so a victory on their travels would not only be welcome this weekend, but it would also keep them above the bottom three. It is set to be a great Saturday at the Northern Echo Arena. Darlington Mowden Park are hosting a double-header which will see their National One clash with Birmingham Moseley come before DMP Sharks’ game against Firwood Waterloo. Both fixtures will be dedicated to former Scotland international Doddie Weir and the club are raising funds for the My Name’5 Doddie Foundation. Weir was diagnosed with Motor Neurone disease in 2017 and 50 per cent of all this weekend’s tickets will be donated to Doddie’s charity as he continues to raise funds. To the game itself and Weir will be pleased see Darlington’s upturn in recent form. Danny Brown’s side have faced three of the top four sides since the beginning of January and have picked up two excellent wins over Old Elthamians and Blackheath. After a tricky first half of the season, DMP seem to be edging towards being back to their old selves, but Birmingham Moseley will be out to halt their momentum in Round 20. The Midlands club dropped back into the bottom three last Saturday after narrowly losing to Old Elthamians, but Moseley will certainly take heart from a spirited performance against a title challenger. Richard Protherough’s side sit two points from safety as things stand so a positive result against Darlington could move them out of the drop zone as we head into February. An impressive second half display against Cambridge last weekend enabled Plymouth Albion to return to winning ways. Albion’s good form was momentarily halted after their loss to Ampthill in Round 18, but Kieran Hallett’s side now enter the final round of fixtures in January having won five of their last six matches. Plymouth sit ninth in the table and nine points clear of the relegation zone, while Caldy’s fortunes are very contrasting. The Wirral club have not won since early December and a run of five games without a victory has left them just five points above the drop zone. On a more positive note, Caldy’s recent defeats have been by narrow margins, but they will be eager to find themselves on the right side of the result this weekend at Paton Field.